October is SIDS Awareness Month and since the weather is changing, it is perfect timing to introduce you to the HALO SleepSack as an alternative for blankets. I want to share my thoughts on the HALO sleepsacks we received for review. My tots do not like sleeping with blankets during the night. I cover them up and they kick them off. Although it's been miserably hot during the day with temperatures in the 90s, it drops by nighttime and cools down a wee bit. We have been running the AC continuously throughout the day and night and I find Kenzie rolled up into a ball in the morning. When she saw the HALO SleepSack for Big Kids, she wanted to put it on immediately (even though it was daytime) and pranced around the house in it. It is easy to put on as you unzip and step in, then zip close. It's roomy in the body and the foot openings allow for movement when awake. The microfleece material is super soft and light, yet provides warmth when sleeping. You can wear it over sleepwear or without. Kenzie loves her new HALO sleepsack and doesn't kick it off when sleeping. She can easily put it on and take it off which is nice. Mason, on the other hand, was a wee bit reluctant to put on his SleepSack Early Walker which was odd since he carried Kenzie's SleepSack around the house on his arm like a purse for days (to Hub's dismay). The concept is the same as Kenzie's SleepSack and perfect for my little blanket kicker because he can stay cozy and flip around without being chilly. I also like that he can wear it while walking around the house once it becomes cold. Yes he is officially a walker, trekking around the house in a flash! During the month of October, HALO will donate $1 to SIDS Awareness for every new Facebook “like”. HALO Innovation’s SleepSack® wearable blankets have become the standard for hospital nurseries and parents alike. In fact, 1,000 hospital nurseries use the HALO SleepSack Swaddle instead of blankets through the HALO Safer Way to Sleep Initiative. HALOInnovations also offers free Safe Sleep Practices kits to childbirth educators to help further the cause of SIDS prevention. Buy It: You can purchase the SleepSack Big Kids for 29.95 and SleepSack Early Walker for $26.95. Make sure to connect with HALO on Facebook and Twitter! One winner will Receive a HALO SleepSack! HALO SleepSack Wearable Blanket100% Organic CottonDots Red would be perfect for my little grandbaby! 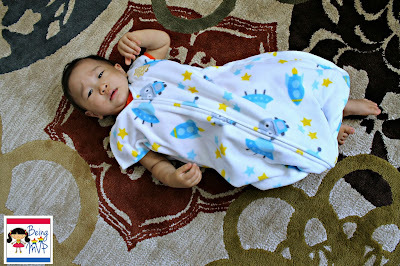 I like the HALO SleepSack Swaddle100% Organic Cotton Cream! It would make a great gift for my friend who is expecting! I love the Micro-Fleece Giraffe! 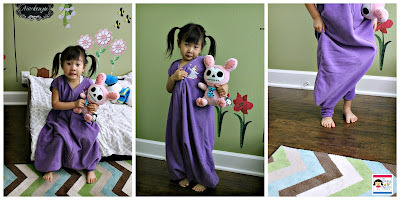 I like the HALO® SleepSack® Early Walker Micro-fleece | Pup Pals as my granddaughter loves dogs. 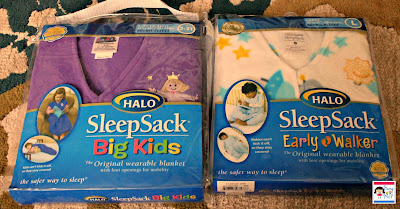 I'd love to have the HALO® SleepSack® Big Kids in Microfleece with the elephant. It gets cold her during the winter and this would be perfect to keep my toddler warm at night! I would get the early walkers sleep sack in the owl microfleece. I have been looking for something for my daughter to wear at night that will be safe for her to roll in yet keep her warm. I would choose the HALO® SleepSack® Wearable Blanket Micro-fleece in Owl Leaves. These are so cute! Thanks! My favorite Halo Sleepsack is the one with the owl leaves. It is just such a cute pattern and color. I love the HALO SleepSack Wearable Blanket100% Organic Cotton Dots Red for my son! Thanks so much for the fantastic giveaway! I like the early walker. I would like the HALO® SleepSack® Wearable BlanketMicro-fleece Ladybug, because it's super cute, love the lady bug and think it would be perfect to keep my grand daughter warm this winter. I want the SleepSack Big Kids Micro-fleece Butterfly. It is really cute but would also be awesome in the winter. My 2 year old won't keep a blanket on and her room stays cold even with the heater on. I like the micro-fleece sleepsack for newborns in Cream, because it looks soft and comfortable. I'm expecting my first baby in November, thanks for the opportunity! I love the HALO® SleepSack® Swaddle 100% Organic Cotton | Cream. It looks so nice, snuggly and protective. I'd love the HALO® SleepSack® SwaddleMicro-FleecePink! I have a newborn coming in March so I'd love the Microfleece Swaddle, with puppy pals print! I like the blue cotton sweater knit. i like the look of that fabric, and it would be for a little boy! I love the Owl leaves one! I tend not to love pastels, so I'd choose the Wearable Blanket Plushy Dot Velboa | Chocolate. It also looks SO soft! I love the HALO SleepSack Wearable Blanket100% Organic CottonDots Red for my best friends baby! I'd most like the cream organic cotton sleep sack because it would work for either gender and I wouldn't have to worry about chemicals in the cloth. My favorite fleece sleepsack is the bluee one. I like the lightweight knit big kids sleep sack in the cupcake. So cute for my daughter. HALO SleepSack Wearable Blanket100% Organic CottonDots Red for the new addition to our family. I'd get a sleepsack swaddle for my newborn. I love the HALO® SleepSack® Swaddle Plushy Dot Velboa in Cream. It looks so soft and plush! I would like the HALO SleepSack Swaddle Micro-fleece in cream because it would be perfect for my newborn nephew. I like the plushy dot velboa swaddle. I'd like the Bee Buddies swaddle. Because the pattern is adorable and gender neutral! I really like the HALO® SleepSack® Wearable Blanket 100% Cotton | Stripes Elephant.There are so many adorable prints available. i like the early walker.my son can use this!! I'd like the big kids sleepsack for boys for a toddler - this is a great idea! HALO® SleepSack® SwaddleMicro-FleeceBlue for my grandson that is due to arrive in Jan. I'd like the HALO® SleepSack Big Kids Micro-fleece Elephant for my daughter who kicks off her blanket no matter how cold it is.